Join the Amazon Reviewer Program! Don't have a blog but still want to review books? We would love for you to join our Amazon Reviewer Program! What is the Amazon Reviewer Program? In the years since we started iRead Book Tours, we've had countless authors ask us how they can get more reviews on Amazon. It is the number one question we get asked time and time again. Clearly, authors are in need of more book reviews posted on Amazon. The Amazon Reviewer Program allows us to offer readers the possibility of reading a book and posting the review on Amazon. Who can join the Amazon Reviewer Program? We are looking for avid readers who post reviews on Amazon once they've read a book. You will need to have an Amazon account to be eligible for this program. We also accept international reviewers who have an account with Amazon.ca and Amazon.co.uk. If you are a book blogger, please note that this program is NOT a blog tour and does NOT include all the aspects of a blog tour such as posting on a specific date, doing interviews, guest posts or giveaways. If you are a tour host with us, you are automatically included in our Amazon Reviewer Program, unless otherwise specified by you. How does the Amazon Reviewer Program work? 1) We send you an email with the offer of reviewing a book. If you opt-in to review, we will send you a gift card with the equivalent amount of the Kindle price so you may purchase the book. The book will then be labeled as a verified purchase in your Amazon account, ensuring that your review will be published and not deleted by Amazon. Or, in some cases, you may be gifted a Kindle copy by the author. You DON'T have to post on your blog or anywhere else and you don't have to promote on social media. But you have the option of posting on Goodreads if you like. This program will be part of the iRead Incentive Program. (Learn more about the Incentive program below). You will gain 3 credits for posting on Amazon and 1 credit for GR. Besides being offered good books to read, you will build a good reputation on Amazon because of your reviews of verified purchases. At iRead, we appreciate the the time and efforts our reviewers expend to help our authors get reviews. We've come up with an incentive program that rewards you for these efforts. For the Amazon Reviewer Program, we give our reviewers credits for their published reviews. 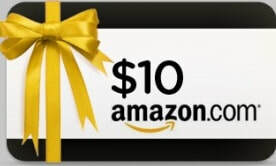 For every 20 credits, you will get a $10 Amazon gift card. Posting your review on Amazon will count as 3 credits, and posting on Goodreads will count as 1 credit. All you need to do is submit the links to your reviews. Therefore 20 credits = $10 Amazon Gift Card! So far we've given hundreds of gift cards to our bloggers! NOTE: If you are a book blogger who is a tour host with us, we will add any credits you accumulate with this program to those you already have from participating in iRead tours. Please fill out the form below. Sign up today!